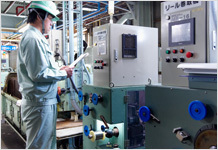 As a steel wire manufacturer, every day our team scans the latest needs and seeds as we tackle numerous challenges. As part of this, we run a “Technological Exchange Meeting”. Here, our departments, customers, and visitors from related companies exchange information and opinions, as well as hints and discoveries about developing new areas and improving existing products. The one-of-a-kind R&D network we have built while strengthening our B2B coordination will continue to contribute to industry development worldwide. The creation of a new product requires a long series of problem analysis and confirmation. 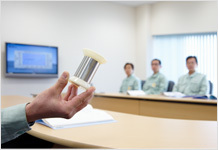 We rely on our corporate ally, Daido Steel Co., Ltd. as well as the independent administrative agency, the National Institute for Materials Science (NIMS) to work together in the process of small-scale production of prototypes, basic evaluation tests for things like strength and corrosion resistance, and operational testing when large scale production happens. Participating in the industry-academic-government development system a number of universities, we continue taking on a variety of cutting-edge industry sectors. Seeking to produce the “Only One”, and to create new value and possibilities, we continue our technological innovation.